Have you ever found something but hadn’t realized it was ever lost in the first place? Like finding money in the pocket of a coat that you haven’t worn in a while? Last week it happened to me while I was editing some photographs and I found this image. 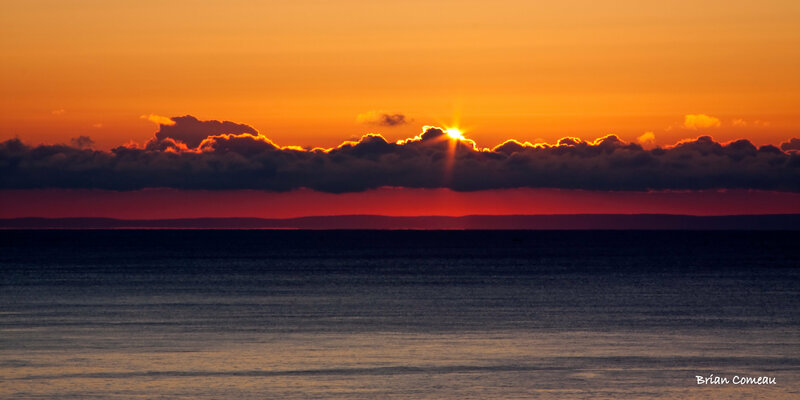 I captured this sunrise on an early morning trip to a place called Cape Spencer in Saint John, just on the edge of the city (literally). The area provides some incredible views of The Bay of Fundy and on a clear day the outline of the Annapolis Valley in Nova Scotia can be seen. This particular day everything cooperated so well; the clouds, a minimal amount of haze or fog and I was there at the right time to see the sun break over the clouds. Photo was taken with a Canon 50D and an EF 28-135mm f/3.5-5.6 IS USM lens extended to 135mm for 1/25 of a second @ f22 and ISO 100. Now how that slipped through the cracks I will never understand. It is stunningly gorgeous. I had one reader say she would never read a blog that posts sunsets and sunrises, but I responded that they are so peaceful and calming that they should be appreciated in everyone’s life. Thank you for the comment Maria. I really appreciate it. I hope you visit again.